Over the next couple of weeks, we’ll be reviewing the contributions of Marriage of Figaro’s three great fathers: Beaumarchais, who wrote the play; Da Ponte, who wrote the libretto; and Mozart, who wrote the music. I’d also like to draw your attention to some films which may help you enter the worlds of these three amazing men. 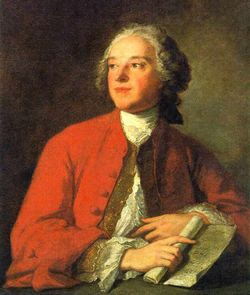 Today, Pierre Augustin Caron de Beaumarchais--the original Figaro. Monsieur de Beaumarchais was the son of a middle-class watchmaker named “Caron”, and when he was a teenage apprentice in his father’s workshop they called him “fils Caron,” or “Son of Caron.” The nickname stuck, and eventually became the name of his fictional alter-ego, Figaro. Beaumarchais wrote three plays about this character: first, The Barber of Seville, a high-energy comedy based on ancient models, in which the wily servant Figaro helps the young and dashing Count Almaviva rescue the beautiful Rosina from the clutches of her tyrannical guardian, the old and foolish Dr. Bartolo. Beaumarchais’ second Figaro play—-The Marriage of Figaro, first performed in 1784—-was the most popular (if not the most important) play of the eighteenth century. According to theatrical legend, the king of France, who feared a public uprising, had held up the performance; but he relented when his wife, Marie Antoinette, championed Beaumarchais’ work. Three people were then trampled to death in the line to buy tickets, the crush was so great. Beaumarchais’s third Figaro play, The Guilty Mother, is a sentimental tragedy which has never become widely popular outside of France. Have you seen Manuel Blank as Puchkine in Journal Secret staged in Paris in 2006? Thanks for posting, no, I hadn't heard of that. He does such a fine job as the young wanna-be pre-Romantic writer as Gudin, in the Beaumarchais film, I'd be very curious to see him as Pushkin.